Tonight, I baked and decorated over 70 cupcakes – 50 mini, and 24 full size. Why? Because I felt like it. So tomorrow, my coworkers and matt’s coworkers are going to be very hopped up on sugar. I feel like I’ve stumbled on a lucky little pot of gold for myself – I used to hate baking, but I’ve come around to it, thanks to my cake decorating class. I spent two hours tonight just relaxing with a piping bag and frosting, listening to music and decorating cupcakes. It’s a good stress relief for me, but what’s even better about it is I pretty much have 0% temptation to eat any cupcakes! I’ll work one into my calorie counting every now and then, but what I love about making cupcakes isn’t eating them – it’s the process of making something pretty, and then sharing that creation with friends. I’m also glad because I feel like I’ve been doing a good job keeping the creativity in my life the last few months. One of my goals for 2012 was to do more creative things, and this blog, cupcake decorating and a few other things have been great for nurturing my artistic side. 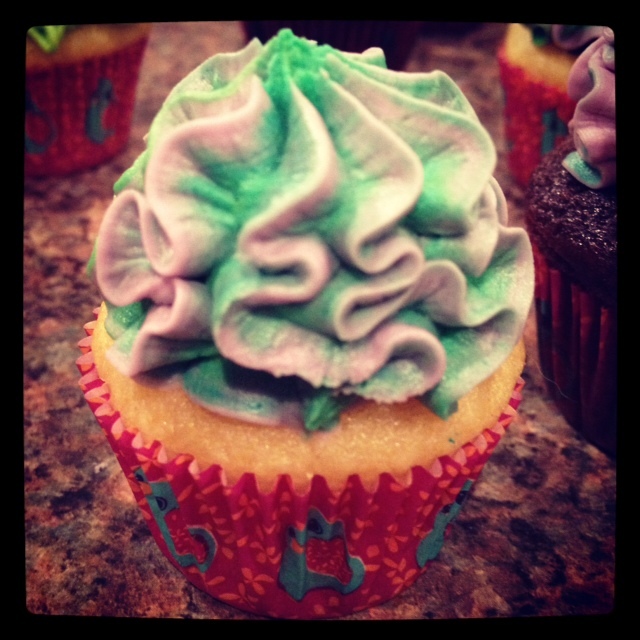 You can do a lot with cupcakes – marbling, filling, piping, sprinkling… the sky is the limit. It’s kind of easy to fall in love with. The only thing I hate about making cupcakes is the clean up! Tonight I played around with the SkinnyTaste Coconut Cupcakes recipe, and made a batch of straight chocolate cupcakes as well. 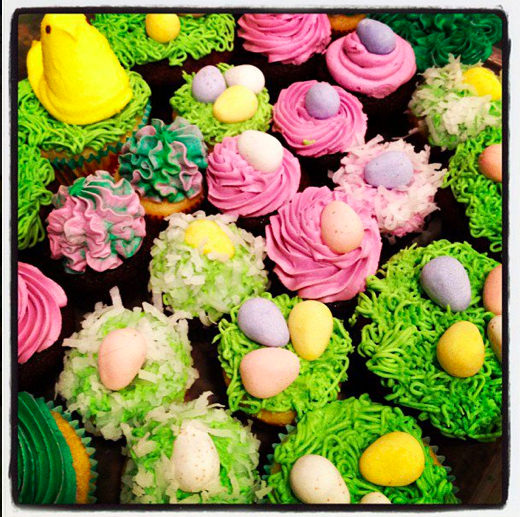 I used peeps, cadbury eggs and shredded coconut on top of standard butter cream to decorate. My kitchen was trashed afterwards, but oh well – it was a good time, and in some small way I might brighten someone’s day tomorrow with a pretty cupcake! 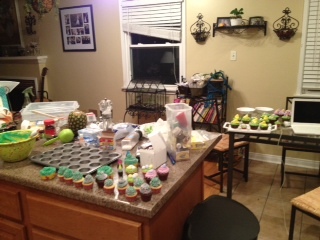 Cupcake baking makes for a messy kitchen! What hobby have you found that just takes you away for a little bit? 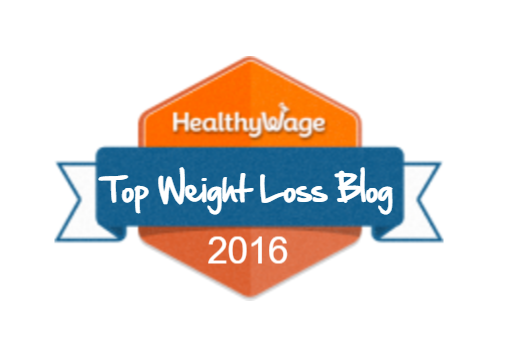 Reading, cooking, running, painting, etc? I wanna know! I hope you’re having a great day! This entry was posted in Food and tagged blogging, buttercream, coworkers, cupcake decorating, cupcakes, easter cupcakes, fun, hobbies, marbling, marbling buttercream, piping, sprinkling, temptation. Those are so purty!!!! YUM. I’m glad you’ve found a good outlet. I have my distraction trifecta of 1) reading science fiction 2) playing guitar and 3) painting. I also find sleeping to be good stress relief. And drinking…and hallucinogenic plant material…and I’m gonna stop. PS. Kidding about the plant material. Love it too much, Alyssa! Please tell Matt to make a film on a cup-cake baker. Looks sooo pretty! Hmmm…. I think you should try the dog-themed cupcakes next. It’s amazing the dog likenesses one can craft with frosting! Woof!